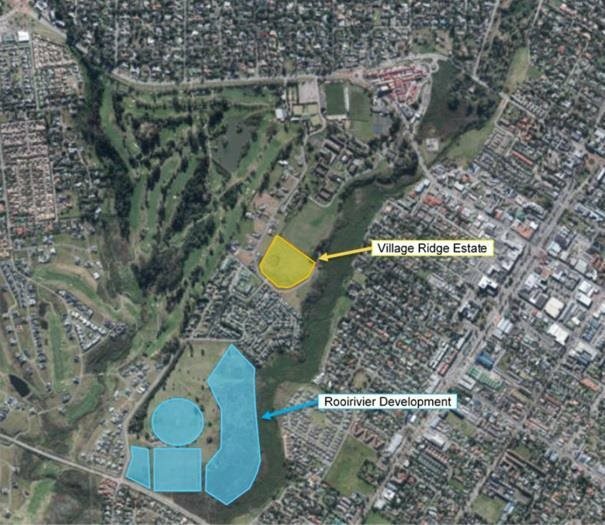 The location of Village Ridge and the Rooirivierrif development indicated. GEORGE NEWS - A Facebook page, The Densification of George, was started by Ingrid van Wyk and Joan Steenkamp of the Glenwood Conservancy in opposition to the municipality's plans for high-density housing. Van Wyk said they are especially concerned about the plans to use the George riding club land and open space along Knysna Road for housing. "George will never be the same and it will be changed into yet another Amanzimtoti or Johannesburg. To lose the riding club and golf course to high-density housing would be a catastrophic loss, both aesthetically and financially. These are two very important facilities for both residents and visitors." The public's reaction on the page varied, and included several comments welcoming the prospect of housing for the previously disadvantaged close to town. The municipality's motivation for integrating different housing levels and activities is to correct distorted spatial patterns, stimulate the economy and optimise infrastructure and services. According to its spatial development framework (SDF) document, municipalities have a strengthened mandate from Spluma (Spatial Planning and Land Use Management Act) to be "bold and brave in managing growth and obligation to heal the spatial apartheid policy". Its aim is a socially and economically integrated city with increased housing choice in well located areas and improved access to opportunities. Responding to a query from George Herald, communications chief Chantel Edwards-Klose said, "The municipality must balance these objectives against the objections received, as well as other impacts that may affect a neighbour's or community's rights and amenities such as traffic impacts, noise nuisances, pollution, health, etc." She said the municipality cannot reply to objections in detail at this stage as the land use application is still ongoing.